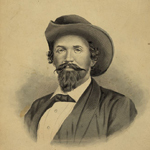 Lafayette S. Buckles was an unmarried 26-year-old preacher when he was mustered into service on the 10th of July 1863. And seven days later — on the 17th of July — he was mustered out. That left reader Matt Mapes, Buckles’ distant cousin, baffled. Well, there’s an answer out there, all right. And what an answer it is! Great info, but the source is identified only as source 76 from a laundry list of published reports, none of which is numbered. No help there. Sooooo… Minute men? Pursuit of the enemy? What’s going on here? And the answer is Morgan’s Raid. So, Matt, your cousin was a citizen-soldier, a volunteer in the defense of his adopted state against invasion, who went off to war without food or weaponry, ready to lay down his life if need be. Great story. And all from one huh? moment in looking at index entries. And the moral of this story is: follow those leads. Every last one of them has the capacity to enrich our family history beyond our wildest dreams. Interesting story—and one of the things I love about genealogy is that it’s just the same as finding all the pieces and fitting them into their proper places when putting together a big jigsaw puzzle! Yup! But of course — sigh — we don’t have the box top to see what the puzzle is supposed to look like — and we have to go find our own pieces!!! Great story, Judy. I have a multi-great uncle who joined a battalion raised by the Lieutenant Governor of Ohio at the very beginning of the War, the unit served for several months guarding railroad tracks, bridges etc in the Cincinnati area. When the emergency subsided, it was discovered that they had never been properly mustered into service, so the whole unit was mustered in and out on the same day. Now that is definitely one of those fun facts, Bob. Cool! Judy, How did you determine that Morgan’s Raid was the cause? Are you that knowledgeable in Indiana history or did you search by date or????? I followed the clues back, Barbara. The index led to the Adjutant General’s report. That report led to the regimental history. The regimental history identified the unit as “minute men from the Indiana Legion.” That led me to find the official report on the Indiana Legion and Minute Men of 1863-64. Thanks, Judy. I imagined you were following the clues. I just didn’t know where the clues were showing up. Now you have given me all my bread crumbs! Much appreciated. I recently picked up 2 books that no civil war buff should be without. The first one is The Civil War Research Guide by Stephen McManus, Donald Thompson,Thomas churchhill.The2nd book is Tracing Your Civil War Ancestor,by Bertram Hawthorne Groene. There is no way you can miss with these 2 books. Thanks for the recommendations, George! Interesting story! I’ve got a possible ancestor myself whose involvement was oddly brief, but unlike the soldier here, his story veers off track from that of his comrades. Gideon F. Morey enlisted 15 September 1862 at Auburn, NY, mustered in 28 Sept, was 1st Lieutenant, Company F, 160th Regiment, New York Infantry volunteers… and then resigned 26 March 1863! From what I have read, (this is from New York in the War of the Rebellion, 3rd ed. Frederick Phisterer. Albany: J. B. Lyon Company, 1912) “The regiment left the State December 4, 1862; it served in Sherman’s Division, Department of the Gulf, from December 25, 1862; in 2d Brigade, Augur’s Division, from January, 1863; in 2d Brigade, 1st Division, 19th Corps, from February, 1863; in the Reserve Brigade, 1st Division, 19th Corps, from August, 1863; in the 3d Brigade, 1st Division, 19th Corps, from September, 1863.” A source more focused on his hometown (Moravia, NY) indicates that the 160th regiment was ordered to New Orleans soon after its formation. Its first engagement was in March 1863 at Bayou Teche, when the rebels destroyed their gunboat Cotton to keep it from capture. So, as you can see, my question is what prompted the man to resign and go home just then? More research lies ahead! Great questions, Karla, and a great family mystery — please let us know when you find out the answers! My guess is that the answer would be in his military documents, but there may be something in a more detailed history book or article. Another oddball piece of information is that in 1912 (after his death) his son tried to get the government to reimburse Gideon’s travel expenses home but failed because (big surprise) he had resigned and it sounded as though the government had already paid for most of the trip home anyway.